A view of the flood-hit areas following heavy monsoon rainfall, at Walbari in Coimbatore on Sunday, Aug 19, 2018. 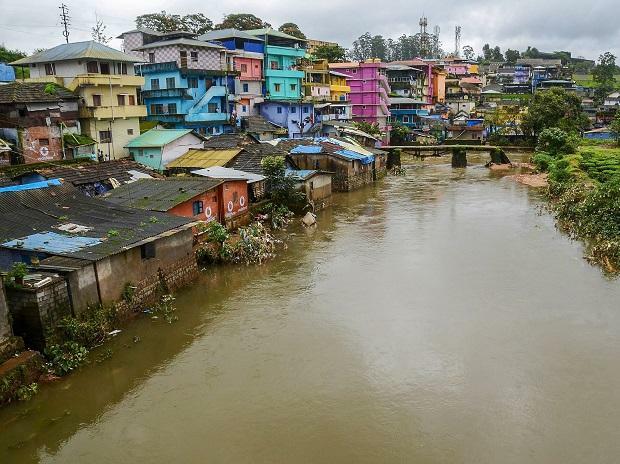 The central government said Monday that the IMD had issued necessary severe weather warnings for Kerala rains last month, refuting the charge that there were lapses on its part. India Meteorological Department (IMD) representatives apprised the state authorities about the strong monsoon conditions with heavy rainfall activity in a meeting convened by Chief Minister Pinayari Vijayan on August 9, according to a statement issued by the Ministry of Earth Sciences (MoES). "Also the Additional Chief Secretary (Revenue and Disaster Management) was briefed orally over phone on all occasions. Member Secretary, SDMA (State Disaster Management Authority) was briefed on August 10. District collectors of Kollam and Thiruvananthapuram were briefed on August 14. Briefings were sent to media also during this period," the statement said. The MoES said the IMD had issued all necessary severe weather warnings through its office in Thiruvananthapuram and extended forecast range was issued two weeks in advance. On August 30, the chief minister in the state assembly had said there were "lapses" on the part of the IMD's rain forecast during this period. The IMD had forecast an estimated 98.5 mm rain in the state between August 9 and 15. But, the actual rain received was 352.2 mm, Vijayan said, adding he purpose was not to find fault with anyone. Weather forecasts for five days and outlook for subsequent two days, which also include heavy rainfall warning and wind warning, were sent through e-mail to Chief Secretary, Additional Chief Secretary (Revenue and Disaster Management), SDMA, Navy, Special Marine enforcement, print and electronic media, the statement added. Short and medium range forecasts (five days in advance) were also issued by the IMD unit in Thiruvananthapuram, it said. The ministry said orange alerts, which mean authorities should prepare for action, were issued with effect from August 6 and applicable from August 8 onwards while red alert, which means authorities start taking necessary action, was issued with effect from August 9. "Further, for showing the severity of rainfall intensity expected, heavy (7-11 centimetres in 24 hours) to very heavy (12-20 cm in 24 hours) rainfall warning for Kerala state was issued with effect from August 10 for August 14 with orange alert to Idukki and Alappuzha, red alert to Wayanad district. "On August 11, heavy to very heavy rainfall warning was extended for August 15 with orange alert to Idukki and Wayanad districts," the statement said. On August 14again, heavy to very heavy rainfall warning was issued for that day and a day later with red alert and orange alerts for most of the districts, the statement said. On August 15, extremely heavy rainfall warning was issued for Kerala state with red alert to all districts for August 16 and red for seven districts and orange for the remaining seven districts for August 17. "It may be noted that the 'Red' alert is the highest alert for issuing heavy rainfall warning and no other alerting criteria than this is adopted by IMD. The weather bulletins issued from Delhi office also carried warnings for Kerala in 'Orange' and 'Red' colours about 2-3 days in advance of the event, advising the disaster managers to be alert and initiate action respectively," the IMD said.